At iSatori, we’ve literally helped tens of thousands of people transform their mind, body and spirit. 2017 is our turn to transform in order to improve how we help you achieve your goals. This transformation starts with our new packaging that is slated to hit shelves as early as January. The transformation certainly doesn’t end there. New products, new athletes, a new website and so much more is on the horizon to help you achieve your goals faster than you ever thought possible. With every change we make at iSatori, we have YOU our loyal customer in mind. Phase 1 of our Transformation is our new packaging which has undergone a major facelift not just visually, but functionally as well. The transformation starts with a new red color that embodies continuous change. Look at our new packaging from different angles and lights and you will see what we mean. The color never stays the same. Just as you continuously progress and change, so do we. Along with the new color, comes new, more user-friendly bottles. For example our number-one-selling product BIO-GRO™ now comes in a round container that is much easier to get your hand into. This new packaging makes it much easier to get that last scoop of powder as you finish your bottle... so nothing is wasted. Our goal was to look at all of the feedback we’ve been getting over the years and improve the overall experience. Our goal was to make iSatori not only easily identifiable on the shelf, but to also maximize the user experience! Regardless of the packaging that you find on the shelf during this transition, you can be assured of the same level of quality in each and every bottle. With this confidence in mind, you will see some minor product improvements on some existing products as well as some new formulas getting ready to hit the market. All BIO-GRO will be instantized for easier mixing and a better customer experience. The powerful base formula remains the same delivering all the bio-active peptides you've become accustomed to, however it will mix better in a shaker bottle or even a glass. A number of new products have been released to the market including L-CARNITNE LS3 + ENERGY, MORPH XTREME which will be available in a delicious Peach Mango flavor. We’ve gone back to the drawing board on this one. Not only will it be easier to navigate and find exactly what you want - the shopping experience is greatly improved as we have migrated to the industry-leading shopping cart. Look for vibrant images, sample opportunities, discounts and integrated social media interactions… just to name a few of the updates. 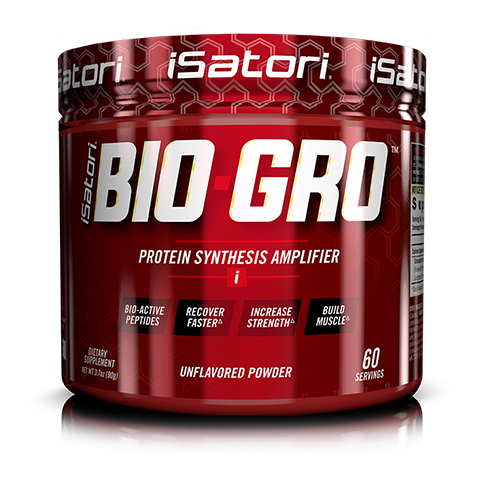 At iSatori, we look forward to bringing you the best sports supplements to help you achieve your goals in not only 2017, but the years to come. Together we can build more muscle, gain more strength, lose more fat and improve our performance!